John went down to the Jordan to preach a message of repentance and baptize everyone who responded to the message. Despite his odd appearance and the harshness of his message, hundreds came to be baptized. Some in the crowd wondered whether or not he was the Messiah, but John pointed away from himself to another. While he baptized with water, the coming one, the one whose way he prepared, would baptize with the Holy Spirit and with Fire. One day, as John was baptizing, Jesus came and got in line. Unlike elsewhere in the Gospels, John doesn’t try to stop Jesus from being baptized. He doesn’t even seem to recognize him. He just immerses Jesus in the waters of the Jordan, like everyone else. However, when Jesus emerges from the water, the heavens open, a dove descends, and a voice calls out from the heavens: “You are my son, whom I dearly love; in you I find happiness.” At this moment God makes a claim on Jesus’s life. It’s at this moment that Jesus receives his calling to baptize with the empowering presence of the Holy Spirit and the refining nature of Fire. We’ve come this morning to remember Jesus’ baptism and remember and reaffirm our own baptism vows to serve God in Christ, empowered by the Holy Spirit. And for those of you who’ve not been baptized, today offers an opportunity to consider what it means to be baptized into Christ. For those of you who have been baptized – what does this sacramental act of the church mean to your life? What difference does it make? As you’re thinking about your experience, I’ll share my own experiences with baptism. As a pastor I’ve baptized a few people, and I expect I’ll baptize a few more people before my ministry concludes. But I’ve also been baptized myself – not just once, but several times. 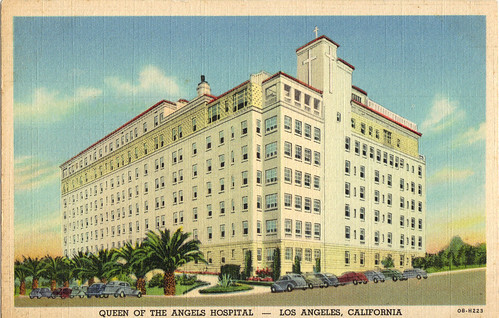 You see, I was born at Queen of Angels Hospital in Los Angeles, which was a Catholic Hospital. Apparently, it was the practice for nurses to baptize babies – just in case. At least that’s what I’ve been told. Not long after that, I was again baptized at St. Luke’s of the Mountains Episcopal Church in La Crescenta. Then, when I was twelve, as was the practice of my Episcopal heritage, I was Confirmed at St. Paul’s Episcopal Church in Klamath Falls, Oregon. On a Sunday Morning in the Spring of 1970, I joined other sixth-graders in confirming the vows made on my behalf at my baptism. And then the Bishop laid his hands on me, even as Peter and John laid hands on the believers in Samaria (Acts 8:14-17), and symbolically conferred upon me the Holy Spirit. Now, you’d think that this was sufficient, but apparently it wasn’t – at least not for me. During high school, after having a conversion experience, I decided I needed to do something to confirm this experience of faith. And so, in the summer of 1975, while at camp, I was baptized in the cold running water of Big Fall Creek. Each of these baptismal experiences involved water, but John also spoke of a baptism with the Holy Spirit. In line with the theology of the church I attended at the time, I pursued and experienced what some call the Baptism of the Spirit, including receiving what Pentecostals call the initial evidence of speaking in tongues. With this experience, I’d covered all the bases – as far as I know! My experiences might resonate with some, and not with others, but I share this for two reasons. One is personal – I have strong beliefs about baptism. The other is church related. From the earliest days of our Disciples tradition, Baptism has played an important role in our life together. Because we practice what is called Believers Baptism and because we baptize by immersion, we look a lot like Baptists. But our theology of baptism has similarities to that of Catholics. “Repent, and be baptized everyone of you in the name of Jesus Christ so that your sins may be forgiven; and you will receive the gift of the Holy Spirit” (Acts 2:38). This seemed like a clear-cut answer to Campbell’s question. Baptism follows belief in Christ and after repentance, and then as a consequence, baptized believers received the assurance that their sins were forgiven and that they had received the gift of the Holy Spirit. Even if you didn’t feel different after Baptism, Campbell believed, and Disciples have taught, that God is faithful to this promise. 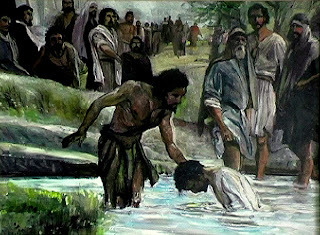 After he came to this understanding of baptism, he shared it with his family, and they invited a local Baptist preacher to baptize all the adult believers in the family upon making the Good Confession as found in Matthew 16: “You are the Christ, the Son of the Living God.” Writing in the Millennial Harbinger in 1832, Campbell describes the scene. From that time on, Disciples have looked to Acts 2:38 as a guide to how we should practice the Sacrament of Baptism. It should come after belief and repentance, and it will lead to forgiveness and the gift of the Holy Spirit. And this understanding fits well with John’s message here in Luke 3. Of course, there are other elements to the way we understand Baptism. For instance, Paul writes in Romans 6, that in baptism we identify our selves with Jesus’ death, burial, and resurrection (Romans 6:1ff). And if we identify ourselves with Jesus, then surely we also identify with Christ’s body, the church. As a result, baptism serves as a point of entry into the community of faith. But, because Disciples believe that baptism ushers us into the church universal and not just a local congregation, we don’t make it a practice to rebaptize people who come to us from other Christian communities, even if their practices are different from our own. Yes, in spite of my own experience, it would seem that once is enough for God. This is why most Disciples congregations practice what we call open membership. Still, even if we recognize a variety of baptismal practice, Disciples churches still follow the pattern and practices that Alexander Campbell saw present in the biblical story. So, if you’ve been baptized, God has claimed you for ministry! Since the liturgical calendar invites us to remember Jesus’ baptism, it’s appropriate for us to reaffirm our own baptisms, and if we’ve not been baptized, to consider whether we should take this step of faith and identify ourselves with Jesus and his body – the church. In just a moment I’m going to invite you to turn your focus on the baptistry, and even though we don’t have a baptismal candidate ready to go down into the waters of baptism today, we can affirm God’s claim on our lives. For as Isaiah said to the people of Judah, living in exile, “Don’t fear, for I have redeemed you. I have called you by name; you are mine” (Isaiah 43:1). This is the promise of God, which baptism confirms and seals with water and the Spirit. Defining God -- Can it be done?